Following a successful trial, we have purchased Brill’s Climate Change and Law Collection. This comprehensive collection of climate change and law documents contains original source, non-edited and non-redacted “grey literature.” Incorporated in the category of ‘law’ is any discipline of law which addresses climate change, including corporate law, environmental law and human rights law. Materials in the collection originate from a wide range of organizations in the public and private sector, institutions, and/or individuals, world-wide. Access this collection via DiscoverEd, or our Law databases AZ list. This entry was posted in New e-resources and tagged Brill, Carbon Emissions, Climate Change and Conflict, Climate change and Corporate Social Responsibility/Sustainable practices, Climate Change and Finance, Climate Change and Food Security, Climate Change and Health, Climate change and human rights, Climate Change and Indigenous Rights, Climate change and law/environmental law/human rights law/land rights, Climate change and market-based instruments, Climate Change and Natural Disaster, Climate Change Negotiations, Climate Justice, database, Environmental law, Global Environment Change/Global climate change, Human rights law and environmental/climate change, Sustainable development on August 23, 2017 by eresources. Covering all aspects of aircraft, helicopter, spacecraft and ballistic system design and manufacture, as well as the design, manufacture and operation of radar, microwave and antenna arrays. Including the MMPDS (MIL-HDBK-5), multiple volumes of the Engineering Design Handbook, unique handbooks on the use of composite materials and the fundamentals of various propulsion systems. This content offering is an essential engineering tool for aerospace, mechanical, manufacturing and materials engineers. 414 e-books added, see list here. Covers structural engineering, code compliance, earth moving, green building, road construction and building with materials such as concrete, wood and steel. Of use to civil engineers designing structures and developing infrastructure projects including bridges, dams, pipelines and roadways. 758 e-books added, see list here. Covers power generation, plant design, energy storage including batteries, transmission line design and operation, electrical safety and energy efficiency. Of use to electrical, power, mechanical and civil engineers designing turbines, power generation plants, transmission towers and cabling, installing pipelines for underground transmission and electrical safety devices. 300 e-books added, see list here. Covers soil and ground remediation, water treatment, solid waste management, recycling, air quality monitoring, environmental pollution, indoor air quality control and total life cycle design. Of use to environmental, civil and geoenvironmental engineers designing treatment processes for industrial pollution, soil remediation, water treatment plants and integrated solid waste management plans. 365 e-books added, see list here. Covers fire dynamics, modelling performance of suppression and ventilation systems, planning for the effective egress of people, staging of first responders and emergency management planning, fire resistant design of offshore structures, and design of fire protection systems in manufacturing and industrial applications. Of use to fire protection, mechanical, HVAC, plumbing and civil engineers designing, building and maintaining fire protection systems, equipment and plans. 115 e-books added, see list here. Covers energy efficiency, fluid mechanics, mathematical functions, systems engineering, design of experiments, geographic information systems, new product development and materials properties. Of use to all engineers requiring quick refreshers on fundamental engineering principles, definitions of specific terms, equations and properties data about specific materials. 571 e-books added, see list here. Covers design of motors and drives, pipe design, hydraulics, fluid mechanics and rheology, boiler and pressure vessel design, HVAC, systems and equipment, ship and vehicle design and manufacturing, Finite Element Method and control of vibration. Of use to mechanical, aerospace, manufacturing, plumbing and automotive engineers designing mechanical devices for improved performance, increased energy efficiency and user satisfaction. 631 e-books added, see list here. Titles have been added to DiscoverEd. These collections will receive regular updates. We already have a subscription to Knovel’s Chemistry & Chemical Engineering collection (618 titles). This entry was posted in New e-resources, Updates and tagged Aerospace & Radar Technology, Civil Engineering & Construction Materials, e-books, Electrical & Power Engineering, Environment & Environmental Engineering, Fire Protection Engineering & Emergency Response, General Engineering & Project Administration, Knovel, Mechanics & Mechanical Engineering on August 16, 2017 by eresources. 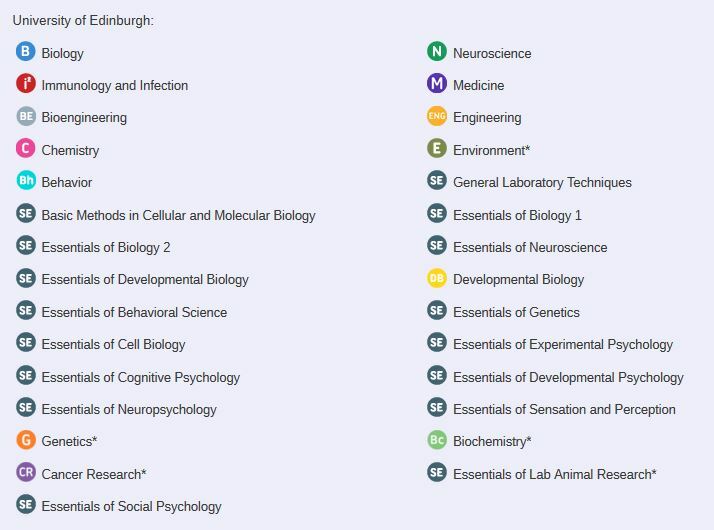 We have upgraded our subscription to JoVE (Journal of Visualised Experiments) to include JoVE Environment, the Advanced Biology Modules and the 3 newly available Psychology modules. JoVE Environment is dedicated to research methodologies that address environmental concerns and seek to better understand Earth’s ecosystem. Special consideration is given to experimental methodologies that assess society’s impact on the environment, suggest solutions for protecting Earth’s resources, and develop sustainable fuel sources. Essentials of Neuroscience provides an introduction to the field of neuroscience. These videos offer a glimpse of neuroscience at the practical and professional level, through an exploration of five major branches of study: neurophysiology, neuroanatomy, cell and molecular neuroscience, behavioural neuroscience, and developmental neuroscience. Essentials of Developmental Biology introduces the field of developmental biology. Researchers in this discipline endeavour to understand the developmental processes that occur in organisms at every stage – starting from the single-celled embryo to the ageing adult. Based on current science, this collection is divided into five sub-categories: developmental genetics, molecular developmental biology, stem cell biology, organogenesis, and ageing and regeneration. Essentials of Genetics focuses on genetics, the study of how genes build traits and how they are passed down from generation to generation. The collection is divided into five modules covering broad sub-disciplines: the genetics of individuals and populations, genetics and disease, gene expression, epigenetics, and genetic engineering. These videos briefly overview important discoveries and basic concepts of each field, introduce key questions being asked by geneticists today, and discuss common tools and experimental approaches used to study and manipulate genes. Essentials of Cell Biology collection provides a glimpse into the field of cell biology. Despite the first observation of cells in the 1600s, scientists are still trying to decipher the questions related to the structure, growth, division, function, and dysfunction of cells. This collection profiles five important cellular phenomena: cell division, motility, endo- and exocytosis, metabolism and cell death. The videos review some of the landmark discoveries associated with these phenomena, highlight a few unanswered questions, and introduce the prominent methods used in cell biology labs today. Essentials of Neuropsychology collection presents multidisciplinary techniques in behaviour, neurophysiology, anatomy, and functional imaging. Well-known behavioural paradigms, such as the Iowa Gambling Task, are demonstrated to diagnose brain damage and mental disorders. Neurophysiological methods, ranging from non-invasive brain stimulation to understanding how cardiac regulation relates to emotional recognition, are also discussed. Moreover, a number of functional magnetic resonance imaging techniques explores how the brain responds in particular behavioural states and to various objects. Essentials of Sensation and Perception collection delves into a variety of procedures to study how the brain processes our complex sensory world and solves problems confronting conscious awareness and visual, tactile, and auditory perception. The videos explore just how well the brain creates assumptions during illusions, such as motion-induced blindness, and even chooses to ignore blatant objects in direct view, like when attention is focused on a demanding task. Essentials of Social Psychology presents classical methods used to investigate how social contexts influence people’s actions, thoughts, and attitudes. Bringing the scientific method into our everyday lives, these videos showcase the wide range of human reactions to different social situations. Moreover, this collection provides a transparent look into social experiments, in order to understand how researchers manipulate situations to elicit behaviours. We will also have access to Essentials of Bioengineering and Essentials of Lab Safety once these modules have been published – expected later on this year. They have been added to DiscoverEd. This entry was posted in New e-resources, Updates and tagged Essentials of Bioengineering, Essentials of Cell Biology, Essentials of Developmental Biology, Essentials of Genetics, Essentials of Lab Safety, Essentials of Neuropsychology, Essentials of Neuroscience, Essentials of Sensation and Perception, Essentials of Social Psychology, Journal of Visualized Experiments, JoVE, JoVE Environment, videos on August 15, 2017 by eresources. The Library now subscribes to International Journal of Performance Analysis in Sport. International Journal of Performance Analysis in Sport provides analysis of actual performance in sport and exercise. Studies using observational methods, biomechanical analysis, self-report emanating from actual sports performance, qualitative observation and measurements such as heart rate response during actual sports performance are all within the scope of the journal. Laboratory studies of key techniques within sports are also of interest where such techniques are clearly important and cannot be analysed in detail during actual competition. Such techniques include tennis serves and golf swings. There may be other contributions that do not analyse sports performance at all that are within the scope of the journal. For example, interview studies or meta-analyses may lead to theoretical contributions explaining the nature of sports performance, tactics used and factors influencing performance. Other topics covered include technologies such as design of analysis systems, sports equipment, research into training, and modelling and predicting performance. International Journal of Performance Analysis in Sport has been added to DiscoverEd. Access is back to vol.1 (2001). This entry was posted in New e-resources and tagged International Journal of Performance Analysis in Sport, Online ISSN: 1474-8185, Taylor & Francis on August 4, 2017 by eresources. The Library now subscribes to the Journal of Computational Biology. It publishes in-depth statistical, mathematical, and computational analysis of methods, as well as their practical impact. This e-journal has been added to DiscoverEd. Access is back to Vol.1 (1994). This entry was posted in New e-resources and tagged e-journal, Journal of Computational Biology, Mary Ann Liebert, Online ISSN: 1557-8666 on August 3, 2017 by eresources.